A lush and lively combination of three grape varietals. This sweet, flirty blush is just as delightful as the Scenic City for which it is named. Two time "Best of Blush" winner. One of the most delicious wine's I have had. Yummy! Wonderful flavor! Working on my second glass. Love it because it is sweet. It is a sweet wine if you don't like sweet wine it's not for you. This is one of my favorites! I lived in Ringgold for 20 years and never stopped here..always wanted to. Now that I live 2 hours away I finally had my first taste and the choice could not have been better than this bottle of wine! This is the absolute best tasting wine I have ever had. I am so sad I could have had more all these years before now...but it wont be my last, because our local store has it in stock! YAY! I attended a tasting here today, and this was by far mine amd my husbands favorite! Loved the sweet and smooth taste of this wine. Received this as a gift and is now my favorite wine by far! Perfect, sweet southern wine!! I do not drink wine at all I do not like the taste but this win was wonderful. 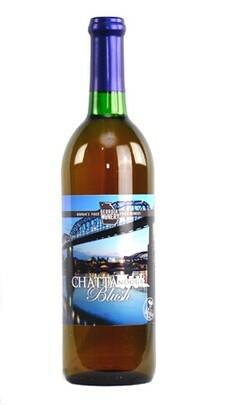 We tried several of their wines at Rock City in lookout mountain and after tasting this I had to buy bottle. This is the most wonderful wine I have ever had. I'm not even a wine drinker for real but this wine is delicious. Sweet. No aftertaste. It's perfect!! !